Home / Home / Hyponatremia : Treatment, Causes, and Symptoms. Recently, Americans have been urged to pay more attention to their sodium intake. Decades ago, all foods seemed heavily salted. Then, a link between sodium intake and high blood pressure was discovered. Suddenly, “sodium – free” or “low sodium” products began flooding the consumer market. Certainly, to a degree, this is justified. Many diseases are worsened by excess sodium intake, and millions of Americans must closely watch the amount of sodium in their diet. However, sodium is a required element for normal body functions. It is lost in sweat and urine and is replaced in the diet. The body has a remarkable ability to maintain sodium and water balance throughout a variety of conditions, thus ensuring our survival. Ultraendurance events challenge this survival mechanism. In hot, humid conditions a large amount of sweat is lost, which can disturb sodium and water balance. Adequate hydration and sodium intake — either via sports drinks or food — becomes vitally important during long races. The goal of this article is to help you determine how to maintain sodium balance during training and racing and during recovery. The information for this article came from a variety of published studies done on healthy, young athletes and may not be appropriate for everyone. Athletes who are under a physician’s care or have health problems should check with their doctor about salt and their ability to exercise in the heat. Hyponatremia — what is it? 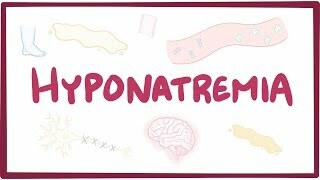 Hyponatremia means a low concentration of sodium in the blood. When it occurs in triathletes, it usually happens during long or ultra-distance races in the heat but may occur anytime. It is estimated that approximately 30% of the finishers of the Hawaii Ironman are both hyponatremic and dehydrated. The longer the race, the greater the risk of hyponatremia. The exact mechanisms are not fully understood and I won’t go into the complex physiologic pathways of sodium and water balance. The simplest answer is that lost sweat (salt and water) is replaced by ingested water (no salt). This dilutes the sodium in the bloodstream, and hyponatremia results. Longer races carry a greater risk of hyponatremia because of the total amount of sweat lost. During exercise in the heat, more salt is lost in sweat per hour than is usually replaced by food and fluids, including sports drinks. Your body can tolerate a degree of imbalance for a short period of time, but it may decompensate if this continues for too long. Sweat contains between 2.25 – 3.4 grams of salt per liter, and the rate of perspiration in a long, hot race can easily average 1 liter per hour. So, for a 12 hour race, one could lose approximately 27 to 41 grams of salt. If the athlete replaces only the lost water and has minimal salt intake, hyponatremia can result. Aspirin, ibuprofen, and other non-steroidal anti-inflammatory agents interfere with kidney function and may contribute to the development of hyponatremia in triathletes. The same applies to acetaminophen (Tylenol). I have seen many athletes taking these drugs during Ironman races, and I strongly recommend against this practice. They won’t make you faster and may hurt you. Under tough conditions, your kidneys need to function at 100%. Other drugs that may contribute to hyponatremia are diuretics, narcotics, and certain psychiatric medications. The spectrum of symptoms can range from mild to severe and can include nausea, muscle cramps, disorientation, slurred speech, confusion, and inappropriate behavior. As it progresses, victims may experience seizures or coma, and death can occur. Severe hyponatremia is a true medical emergency. Minor symptoms, such as nausea and mild muscle cramps, can be treated by eating salty foods and hydrating with a sodium containing sports drink. More severe symptoms require treatment by qualified medical personnel. If you think you are suffering from hyponatremia or are unsure, seek medical attention immediately. There are no clear cut guidelines, and recommendations need to be individualized for each triathlete. Some authorities recommend drinking less water to rebalance sodium and water intake. However, given the risk of dehydration and heat injury, this is not a practical recommendation. To reiterate, all of the hyponatremic athletes in the Hawaii Ironman were also dehydrated. Others recommend increasing salt intake, and this seems more prudent. By ingesting more sodium, hydration with water is balanced and dilution of blood sodium does not occur. It cannot be stressed enough that you have got to know what your needs are prior to race day. Rehearse your hydration, feeding, and salt strategy during your training sessions. There are so many variations between individuals that there is no single right answer. Know what your body’s’ needs are. Drink frequently to attempt to stay hydrated. During a long, hot race, aim for a total sodium intake of approximately 1 gram per hour, as recommended by Doug Hiller, M.D. from experience with the Hawaii Ironman. Please note that this may not be appropriate for everyone. During training, heat acclimatization, and for several days leading up to a big race make sure that you increase salt intake by 10 – 25 grams per day. Sodium is also important for recovery. A Texas favorite after a hot training ride, or run, is low-fat tortilla chips (salty ones) and picante sauce (quite salty). Avoid aspirin, ibuprofen, or other anti-inflammatories, and acetaminophen during exercise, but especially during a race. Check with your doctor if you have any health problems. Undoubtedly, some of you have noticed that FDA food labels list grams (or milligrams) of sodium, and at times in this article, I have referred to grams of salt. What is the difference? Salt is made up of sodium and chloride. The FDA labels lists only the sodium content. This is because there are usually other sodium containing salts (eg. sodium citrate) in these products. To avoid confusion, the easiest way to ensure that you have enough sodium intake is to get used to reading the FDA labels. For example to get 1 gram (1000mg) of sodium into your body, you would need to drink more than half a gallon (2.18 liters) of Gatorade — certainly impractical every hour! To get 1 gram of sodium from table salt, you would need to ingest 2.5 grams (1 gram from sodium, 1.5 grams from chloride). A teaspoon of salt weighs approximately 6.6 grams. It is best if you strive to get your sodium from both sports drinks and salty foods — as opposed to salt tablets — for two reasons. Salty foods stimulate thirst, and it is possible to ingest too much salt with tablets but very difficult with food. If you don’t think that your food and sports drink is providing enough sodium, then consider salt tablets. Make sure you know how much you are taking! Ideally, foods consumed during a long race should be low fat, low protein, high carbohydrate, and provide a source of sodium. You need water, carbohydrates, and salt to survive a long race. For convenience, I have listed a few foods and sports drinks and their respective sodium content. You’ll need to experiment and find the combination that is best for you. Get used to reading the FDA labels.